REMEMBERING THE OLD LANDMARKS- WHAT GOD HAS DONE FOR US! They built a memorial of 12 stones to remember what mighty works God had done for them. 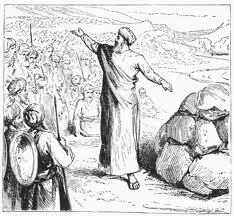 After Moses’ death, God used Joshua to lead His people onward to conquer Jericho. God showed His miracle-working power by stopping the waters of the Jordan River so that they all passed over on dry ground! REMEMBER WHAT GOD HAS DONE FOR YOU! So a memorial and landmark was built to be a ‘sign’ to tell their children and their children’s children about God’s mighty deliverance and great love for His people! REMEMBER WHAT GOD HAS DONE FOR YOU! This Christian Hawaiian church was built in 1942, over 70 years ago, in Hau’ula on the northeast coast of O’ahu, Hawaii. I saw it recently when we went on a family picnic to the other side of the island. It is easily driven by and missed in Hau’ula, so you have to be looking for it. It is said to be in need of major repairs. As a young child I remember my dad driving us out in the country to this tiny church that seats 80 people. Back then we dressed our best to go to God’s house! My dad stood tall and straight as I heard him sing ‘Onward Christian Soldiers‘ and other hymns. The love of God was planted in my heart at a young age by godly parents. I will always remember this landmark in my life! Praise God! Posted on May 19, 2014, in Created to Praise God, Enduring Love, Hearing From God And His Word and tagged Crossing the Jordan River into Jericho, God's Mighty Power and Deliverance of His People, Important landmarks and milestones, Joshua, Remembering what God has done. Bookmark the permalink. 1 Comment. My husband pastors in an old church building. Everything about it is ancient, including the old curved pews and homemade offering boxes. Recently we painted the exterior and removed an old light fixture that was about to become a fire hazard, the wiring was so frayed and worn. I love the way it smells like an old church. It seems like a place that has a certain calm inside it because of saints who went before. Sometimes we sing “Onward Christian Soldiers”, too. And there is one young man I know, for sure, will always remember it’s quaint interior for the reason that you mentioned, that he gave up his own life for a life of liberty in Christ. We’ve had several re-dedications, too, It is a lovely old place to start over! The people are quite aware of the gift it is, which is good, as they agree readily to taking good care of it. They also are aware of the gift it is to have a plain, true Christian atmosphere in which to worship and grow, and seem very sweetly dedicated to it.